Nelson County was in the path of one of the most devastating natural disasters that the Commonwealth of Virginia has ever experienced. 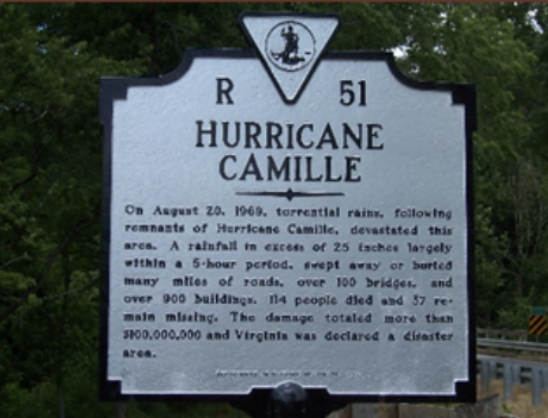 Classified by the National Weather Service as a Category 5 hurricane, Camille came ashore along the Gulf Coast on August 16th causing major destruction in that region. The deluge that fell on the Blue Ridge Mountains three days later came without warning. "A rainfall in excess of 25 inches largely within a five-hour period, swept away or buried many miles of roads, over 100 bridges, and over 900 buildings. 114 people died and 37 remain missing. The damage totaled more than $100,000,000 and Virginia was declared a disaster area." (Text from Virginia Historical Highway Marker. Department of Historical Resources). [Note: The official number of lives lost is 124.] 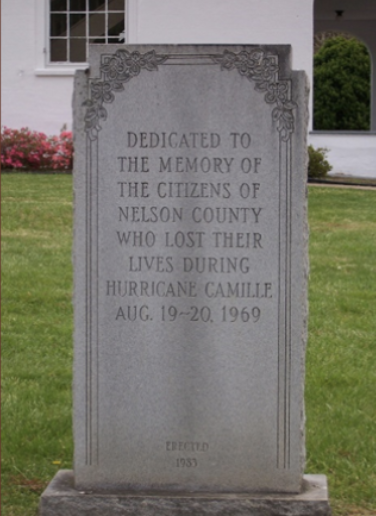 Recorded by the National Hurricane Center, the central barometric pressure dropped to 26.62 inches of mercury, making Camille the second lowest ever measured for a landfall hurricane in the U.S.Population of the county in 1969 was about 12,000, resulting in 1% of the population perishing during the flood. The damage to the roadways, bridges and railroads was monumental. Most bridges over the Piney, Rockfish, and Tye Rivers were destroyed or heavily damaged. Transportation came to a standstill with access into the county on the major highways virtually impossible for several days. Through the resilience of the county residents and help from the state and federal governments, the county found support in the rescue, recovery, and rebuilding following the flood. The efforts of the Mennonites and other volunteer organizations provided valuable services to the citizens of the county. The Federal Emergency Management Agency (FEMA) was established after the Camille tragedy, the result of a need to coordinate natural disaster relief under a single federal agency that could assist state and local governments. Stefan Bechtel, Roar of the Heavens, Ctiadel Press-Kensington Publishing Corp., 2006. Paige Shoaf & Jerry H. Simpson, Jr., Torn Land, Lynchburg VA, J.P. Bell and Co., 1970. Ernest Zebrowski and Judith A. Howard, Category 5 The Story of Camille Lessons Unlearned from America's Most Violent Hurricane, University of Michigan Press, 2005. J.B. Halverson, Queen of Rains: Hurricane Camille, Weatherwise, 2005. Nelson County, Virginia Heritage 1807-2000, Walsworth Publishing Co., 2001. Oliver A. Pollard, Jr., Under the Blue Ledge, The Dietz Press, 1997. Paul Saunders, Heartbeats of Nelson, Saunders Publishing LLC, 2007. Rick Schwartz, Hurricanes of the Middle Atlantic States, Blue Diamond Books, 2007. Earl Swift, The Tangierman's Lament and Other Tales of Virginia, UVA Press, 2007.